The Bradford Student Lamp in Antique Tin is a uniquely styled lamp that works well in a study area or in the bedroom. Created with double shades for maximum lighting, the Double Student Lamp is useful for any area in the home. See more of our Lighting Collection! Thank you for choosing to shop with us and considering our Primitive & Colonial Lighting! Enjoy the warm glow of the Hanging Lantern. Reminiscent of times when any nighttime chores were accompanied by the light from a lantern. 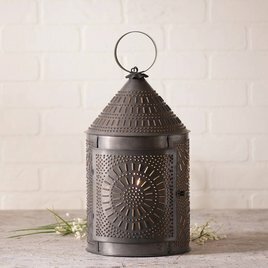 The blackened tin lantern is perfect on a covered porch or in a favorite corner in your home. 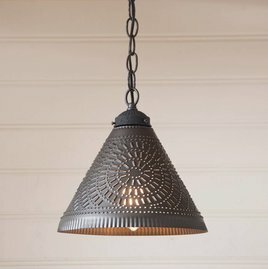 The Springhouse Pendant is the largest pendant we carry in this finish, a nod to the era of local family farms. 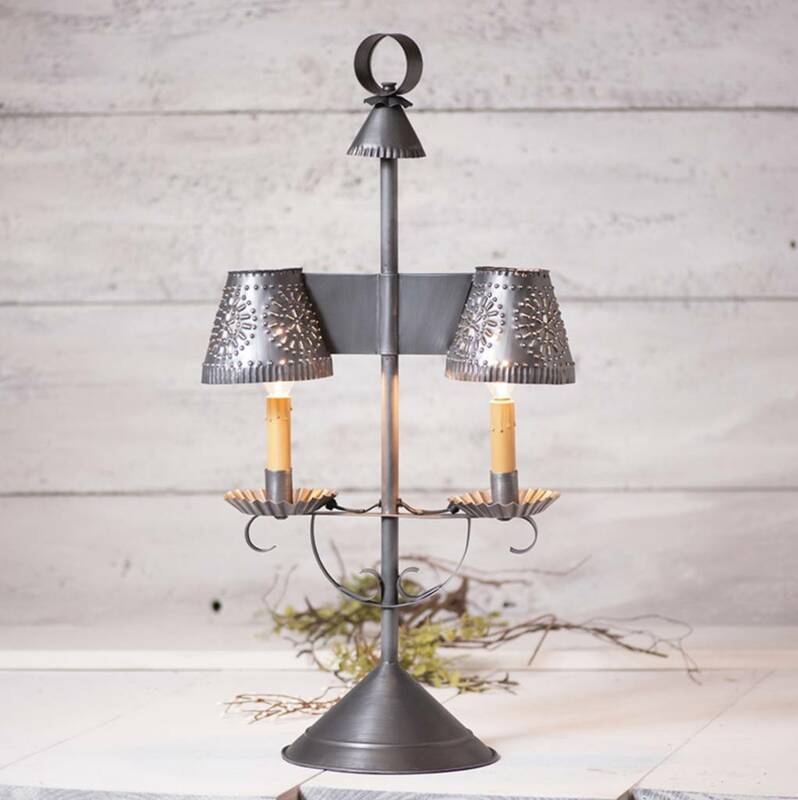 Perfect over a table, grouped with 2 or more over a bar or in a place needing the warm glow of this light. 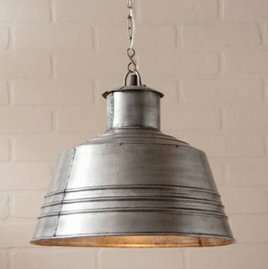 The Pennycress Punched Tin Witch's Hat Pendant light is perfect if you're looking for rustic charm for your country home. 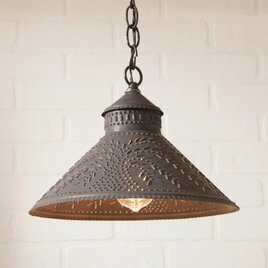 This pendant is a beautifully crafted down-light. Featuring outward punching in the chisel design. Made in Pennsylvania, USA. The Stockbridge Shade Light is designed to be smaller in size so that it can be used above a sink or in groups above a kitchen island. Finished with a fine crimping on the edges and a rustic punched willow design. Made in Pennsylvania, USA. 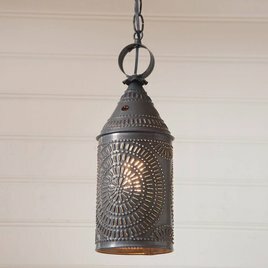 The 17-Inch Fireside Lantern in Blackened Tin is an update version of the Revere Lantern that has the most popular punch pattern. You'll love the warm cozy glow on your wall. 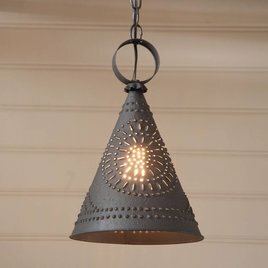 A perfect accent light for your living room or kitchen area. Our 15-Inch Electrified Wall Lantern in Blackened Tin brings a back a touch from the days of early Pioneers. 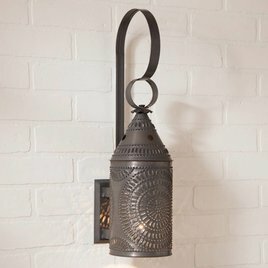 This electrified wall lantern is a beautiful way to bring a little bit of that farmhouse feel to your home. Perfect over each side of a bed. 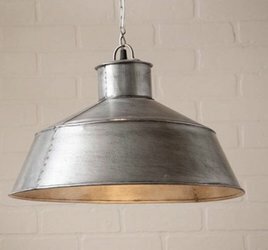 Bring a classic utalitarian pendant to your home, the Canning Table Pendant in Brushed Tin. Bring a clean, smooth line, to your island, sink area or laundry room. A perfect compliment for your farmhouse or country style home. The Wellington Shade Light in Kettle Black is perfect over a kitchen island, bathroom vanity or over a sink. Coordinates with the popular Wellington Lights. The shade design, size and finish match perfectly with our other Wellington offerings.